London Stansted Airport is ready to present an important technologic development: new self-service “Smart Access” scanners are already starting to replace the manual boarding pass checks for all the passengers taking a plane at the airport. The system is very precise and it’s similar to the Oyster card in use at London Underground stations. How does it works? “Smart Access” scans boarding passes and verifies that passengers are travelling on the correct flight and date. To enforce this system, the London Stansted Airpor spent £1.2 million. MacDonald Humfrey , an industry leader in airport systems, provided to design, manufacture and tune the “Smart Access”. Stansted Airport’s Terminal Manager Neil Banks declared: “The introduction of the new ‘Smart Access’ system will make it quicker and simpler for passengers to reach the departure lounge. The innovation is the first part of some really exciting changes planned across the airport. 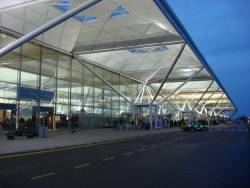 Stansted is already one of the most efficient and easy to use airport terminals but we want to make it even better”. Arriving to London Stansted Airport is really easy: the airport transfer company Terravision operates a shuttle bus service between Stansted Airport and London Victoria and London Liverpool Street. These services are comfortable, cheap, easy to book and the frequency is excellent: there is a bus about every 30 minutes.